(Athens) – The Greek government’s move on April 20, 2018, overturning a binding court ruling ordering it to end its abusive policy of trapping asylum seekers on Greece’s islands raises rule of law concerns, 21 human rights and humanitarian organizations said today. Rather than carrying out the April 17 ruling by the Council of State, the country’s highest administrative court, the government issued an administrative decision reinstating the policy, known as the “containment policy.” It also introduced a bill on April 19 to clear the way to restore the policy in Greek law. Parliament members should oppose such changes and press the government to respect the ruling. Parliament began discussing the draft law on April 24. But the government has preempted the debate on the bill, including the issue of the containment policy by reinstating it. On April 20, the new director of the asylum service reissued an administrative order setting down the reasons for the containment policy. Among grounds given to justify the restrictions imposed by the policy are the need to implement an EU-Turkey deal on migration and a broader public interest claim. But the decision goes against the Council of State ruling and Greece’s responsibilities under international, EU and Greek law, as it offers insufficient justification for the restrictions, the groups said. The Council of State’s April 17 ruling said that Greece’s containment policy had no legal basis and that there were no imperative reasons under EU and Greek law justifying the restrictions to the freedom of movement of asylum seekers. It ordered the annulment of the administrative decision imposing the restrictions and permitted the free movement of asylum seekers arriving on the islands following the ruling’s publication. The ruling also highlighted that the disproportionate distribution of asylum seekers has overburdened the islands. The ruling is limited, however, applying only to new arrivals. The draft law is currently being discussed before the parliament’s Standing Committee for Public Administration, Public Order and Justice and will be debated by the full parliament in the coming weeks. The bill seeks to provide a legal basis for the containment policy. It would incorporate into domestic law EU Directive 2013/33, which sets standards for the reception of asylum seekers. While the draft bill would possibly bring some improvements to the Greek reception system, the directive allows restricting the movement of asylum seekers when the government considers it necessary for rapid processing and effective monitoring of claims. The Greek government presumably believes that the legislation would provide a stronger legal basis for maintaining the containment policy. Greece’s abusive containment policy was put in place in March 2016, with the support of the European Union and its member states. By the latest government count, more than 15,400 asylum seekers are on the Greek islands. Many are living in crowded and filthy processing centers, and many spent the winter in lightweight tents or even sleeping outside on the ground. The Greek government contends that the containment policy is necessary to carry out its commitment under the March 2016 EU-Turkey migration deal, under which asylum seekers must be returned to Turkey to have their asylum claims processed there, although the text makes no reference to such a policy. The case was brought before the Council of State by the Greek Council for Refugees, a non-governmental organization providing legal support to asylum seekers. Nongovernmental groups began a campaign to #OpenTheIslands in December 2017, calling on Greece and its EU partners to transfer asylum seekers to the mainland before winter and end the containment policy. In seeking to justify the containment policy, the Greek government, EU institutions, and governments point to increasing numbers of migrants and asylum seekers crossing the Aegean Sea, some fleeing intensified conflict in Syria. Yet there is no evidence that lifting the containment policy would be a pull factor, as Greece and others claim, especially given the largely closed borders along the Western Balkan migration route into Western Europe. It is evident that the Greek authorities cannot meet the basic needs and protect the rights of asylum seekers while they remain on the islands, the groups said. The containment policy traps people in conditions below EU minimum standards, impedes their access to necessary services, and denies them access to fair and efficient asylum procedures because of the overcrowding on the islands and the lack of basic services. Rather than restoring its abusive containment policy, the Greek Government should respect the rule of law, immediately carry out the Council of State ruling by allowing asylum seekers to move to the mainland, and along with its EU partners ensure protection for all asylum seekers in Greece, the groups said. The government should rapidly expand safe accommodation and access to services on the mainland and create a system to move people quickly to mainland accommodation that provides for their medical and mental health needs while their asylum application is processed. The EU should look at sharing responsibility across member states and increasing availability of more safe and legal channels into the EU. Containing asylum seekers on the Greek islands in substandard and appalling conditions that violate their rights and Greece’s international obligations cannot be justified for migration control purposes, the groups said. If you’ve ever been to a traditional Greek celebration, you will have seen people joining hands and dancing in a circle following the same steps to the accompaniment of live music. You will also have heard songs sung in Greek as most traditional tunes go hand in hand with lyrics talking about love, emigration and rural life. In the northernmost parts of the Greek regions of Western and Central Macedonia, however, all the folk dances are instrumental tunes. Lyrics have been replaced by loud, brass and woodwind instruments like the cornet, the trombone and the clarinet. This is not some peculiar aspect of the local musical heritage. Traditional tunes in these regions had their own words – but they were in a language that the Greek state has tried to wipe out for nearly a century: Macedonian Slavic. After emerging victorious from two Balkan Wars in 1912 and 1913, Greece’s territory and population expanded dramatically by the addition of the lion’s share of the historic geographical region of Macedonia, the part found on the southern side of the Voras/Nidže and Belles/Belasica mountain ranges. As is often the case in history, state borders did not coincide with linguistic ones. The so-called “New Lands” were a diverse mosaic of different linguistic groups, including 260,000 people who spoke varieties of a south Slavic language they called tukasni “local”, nashta “ours” or makedonski “Macedonian”. These varieties, including the standardised version that is today the official language of FYR Macedonia, have similarities with Bulgarian – and many people in Bulgaria view them as Bulgarian dialects. But sociolinguistics has shown that what counts as a language in its own right and what is seen as a dialect of a language are essentially decided by political rather than linguistic criteria. 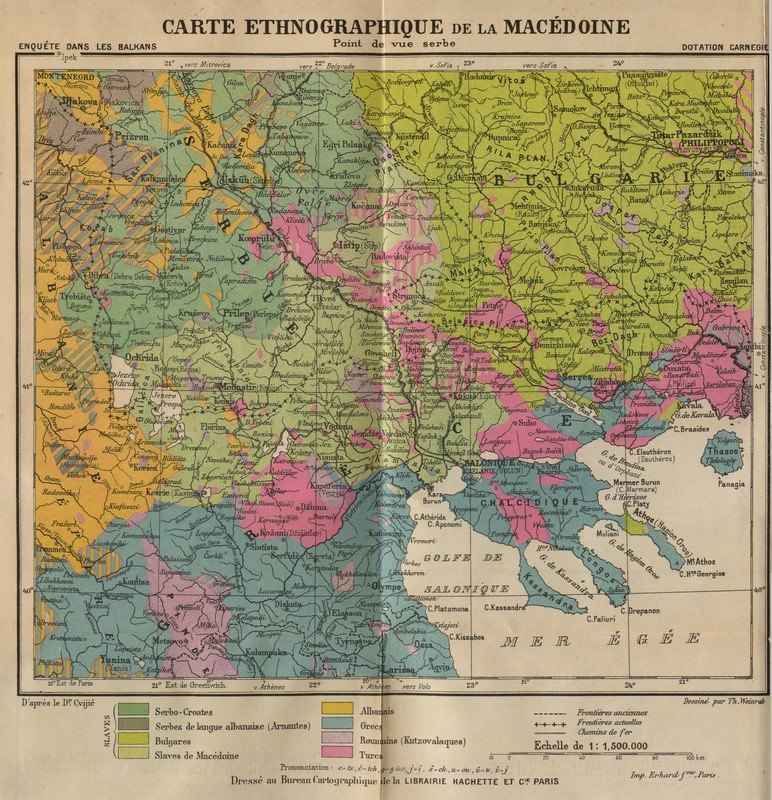 Ethnographic map of Macedonia, 1914. Carnegie Endowment for International Peace, 1914. For the Greek government, having people speaking Macedonian Slavic in its territory did not sit well with its national ideology. Signs of discomfort towards Greece’s new multilingual reality showed very early on. In 1920, the Greek statistical authority ran the first census after the country’s territorial expansion. A language question was asked but the data for the Macedonia division were never published. The language data for the Thessaly division, however, record speakers of Macedonian Slavic, probably reported by seasonal workers from Macedonia who were in Thessaly at the time of the census. Greek authorities acknowledged the presence of Macedonian Slavic as a legitimate language but made a conscious effort to conceal the number of people who spoke it. My own paternal grandfather’s family name became Karatsareas from Karachorov. My maternal grandfather’s one became Kantzouris from Kanzurov. The area of Karadzova was renamed Almopia with its main town of Subotsko becoming Aridaia. The dance Puscheno was called Leventikos or Lytos. The aim was to leave no visible trace of Macedonian Slavic in public records. In the 1930s and in a climate of competing nationalisms in the southern Balkans, the similarities between Macedonian Slavic and the languages of the then Kingdom of Yugoslavia and Kingdom of Bulgaria began to raise suspicions among Greek authorities about the national allegiance and “consciousness” of Macedonian Slavic speakers. In August 1931, Greek journalist and subsequent politician Periklis Iliadis called in his newspaper column for a ban on greeting in “Bulgarian” and publicly singing songs in languages other than Greek – two proposals that Ioannis Metaxas’s fascist regime promptly adopted. In 1936, the governor-general of Macedonia issued order of prohibition 122770: “On the restoration of the uniform language”, banning the use of Macedonian Slavic in both public and private. People caught speaking Macedonian Slavic – sometimes by police officers eavesdropping through people’s windows – were dragged to military police stations where they were beaten and sometimes tortured. Those who had the money were fined. Teachers beat pupils who spoke Macedonian Slavic in class or in the playground – even when that was the only language they were able to speak. This happened to my maternal grandmother. In 1994, Human Rights Watch called for Greece to end harassment of Macedonian Slavic speakers. In 1998, the European Court of Human Rights ruled that Greece violated the right of its citizens to form associations by refusing them permission to establish a Macedonian Slavic cultural association. But these calls came much too late. In the face of the aggressive and violent oppression they suffered in the 1930s, Macedonian Slavic speakers developed a deeply ingrained fear of speaking their language in front of people they did not know and trust. They stopped singing their songs, playing only the traditional tunes of their musical heritage. With time, they started using Greek more to refer to themselves and the places where they were born and live. Today, only older people speak the language. For younger people, it is more of a passive knowledge – a kind of heritage that will die out with the older generation and the only thing that will remain to remind them of it will be a handful of words and tunes to which young musicians do not know the words. This sort of linguistic oppression is far from unique. Similar stories have been reported by speakers of Irish in Ireland, Scottish Gaelic in Scotland, Welsh in Wales (read Susan Elan Jones’s comments in Column 377), Catalan in Spain, Native American languages in the US and Aboriginal languages in Australia. It is sad that the efforts of state authorities to make speakers of minority languages assimilate to the majority language were for the most part successful. And alongside the languages, other expressions of culture are being lost, including place names, family names, songs, dances, games and traditions. Linguistic oppression and the consequences it has on speakers of minority languages and their cultural heritage have no place in a modern world where the value of cultural diversity is recognised.